Our country beach house is located on the Island of Oahu approximately one hour from Honolulu and the Airport. The house is a six-bedroom, four-bath, two-story home on an acre beach lot with an outdoor Jacuzzi overlooking the ocean and an all sport court (paddle tennis, basketball, and badminton) in a fenced compound. Each floor has a master bedroom overlooking the ocean and there is a full kitchen on each floor so it is designed to accommodate two families. The bathrooms have just completed remodeling (February 2010). There is a massage deck and hammock hidden in a tree-covered area for privacy and it is only yards from the beach. There is also an outdoor dining area that seats 10 under the trees for that perfect BBQ. There are beautiful views of the ocean from the wrap-around decks. It is literally one of the most beautiful protected bays in the Islands. Many of the older families in Honolulu have their private beach homes on this bay. The house is a quiet, upscale property which is popular with local artists, writers, etc. Quiet, beautifully equipped, right on the beach which is too rocky to play in right in front but a short walk along the beach North is perfect. Home easily fit our family of 11 adults (was to be 12 initially) with space for everyone. We ate out and in and facilities were ideal for both. We've stayed other places on the North Shore - this was the best, not the least expensive however. We spent a glorious week at Moani Kai which was one of the most beautiful and well maintained vacation rentals I have ever experienced. First, the beach at Malaekahana Bay is three miles of beautiful desolate sandy beach with small waves and completely protected from the fierce breaks of the north shore. The house has recently been completely remodeled with resort quality linens and very comfortable 6 bedrooms. It is located on lush 1 acre lawn with paddle tennis court, hot tub overlooking the ocean and two kitchens so the parents stayed upstairs and the kids and grandkids stayed downstairs. There is a beautiful dining pavilion reminiscent of a Tuscany outdoor dining area with string lights all over looking the ocean. There is a hidden sun tan/massage deck that is next to the ocean but allows privacy to sunbathe in complete privacy. And there is a colorful hammock that we spent hours in enjoying the sound of the breaking surf. The house is well equipped with beach equipment, lounge chairs, boogie boards, children toys who used them in the massive yard next to the ocean. There are two master bedrooms, one upstairs and one downstairs and both have sliding floor to ceiling glass doors overlooking the ocean. We loved the charming caretaker who arranged for private chefs and massages at no extra charge (except a generous tip which she deserved). We loved our nightly bonfires under the moonlit skies. It was a wonderful and authentic Hawaiian vacation. It is the country and not the four seasons. But Malaekahana Bay is Hawaii's best kept secret where most of the houses are owned by the old families of Honolulu for their beach homes. Can't wait to return. I can't think of a better way to experience old Hawaii away from the glitz of Waikiki and a place to enjoy the very special Hawaii we all dream about. 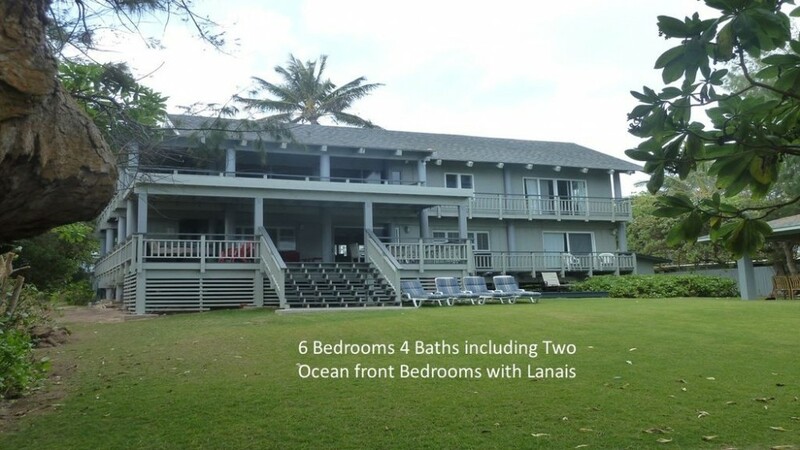 The Moani Kai was absolutely beautiful....the house is well equipped inside and out........kitchen has everything you would need...... outdoors had surf boards, chairs, toys for kids, towels....just bring your swimsuit!! There's enough room to accommodate the young active ones and space for relaxing and peacefulness. The property is right on the beach yet private. We will rent again!!! The caretaker was friendly and helpful. We had the very best time at Moani Kai. Our children and their families spent four wonderful days at this totally enjoyable home. Being residents of O'ahu and most of our family coming in from the mainland we wanted to make sure that their stay was the best ever. Moani Kai did not disappoint. Highly recommended. I'd definitely stay here again.